This is a designer festive round ornament made by the Glass Eye Studio in Seattle, WA. It is transparent cobalt blue with flecks of dichroic sparkly glass on the surface. 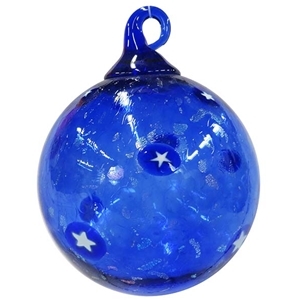 It features white stars spread out on all sides of the ornament. All glass from Glass Eye Studio contains ash from the 1980 Mt. St. Helens Eruption. Their work is individually crafted by artists, not machines. This ensures that every piece has its own unique characteristics, just like the individuals who collect it. 31 8" in diameter. This is a designer festive round ornament made by the Glass Eye Studio in Seattle, WA. All glass from Glass Eye Studio contains ash from the 1980 Mt. St. Helens Eruption. Their work is individually crafted by artists, not machines. This ensures that every piece has its own unique characteristics, just like the individuals who collect it. 3" in diameter.